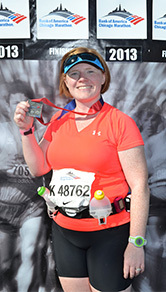 Jillian Warren – Communication | Marketing | Writing | Web | Media | Raleigh & Durham, NC – I Ran the Chicago Marathon! I just knocked a major milestone off my bucket list! I ran my first marathon, and I did it in my hometown – something I’ve wanted to do since high school! I grew up with the Chicago Marathon. 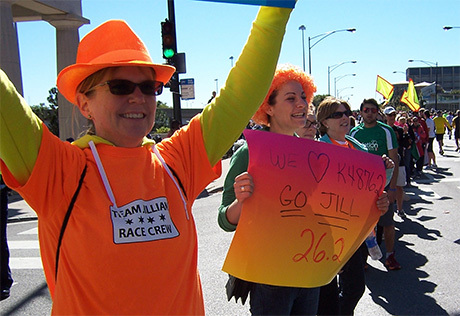 As a teen in the Chicago suburbs, I volunteered at the race with my cross-country teammates, cheered for my running relatives, and witnessed a world-record finish. I ran my first half marathon several years ago, but I’d been plagued by injuries ever since. Two years ago I decided to get serious about running again. 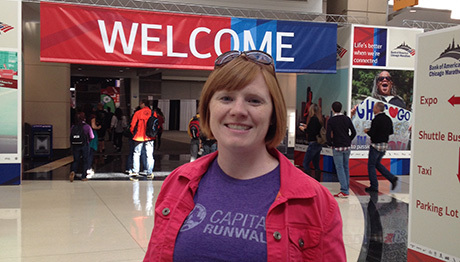 I joined Capital Run Walk’s Fit-Tastic 5K program and the Raleigh Galloway long-distance training program, with the goal of running the 2012 City of Oaks Half Marathon – and then, if that went off without a hitch, the 2013 Chicago Marathon. Read the full story of how I overcame injury to run a pain-free 5K and then moved on to longer distances. I made it through City of Oaks injury-free, and I successfully registered for the Chicago Marathon (despite the unexpected system crash that made registration nearly impossible!). I ran a sub-2:30 half in Wisconsin but injured my leg in the process. 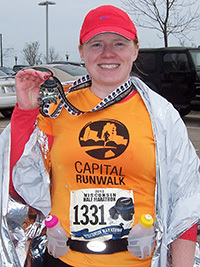 I spent the spring training for the Wisconsin Half Marathon (another excellent race! ), but unfortunately suffered a calf strain the week before the Galloway season started. I had to take 6 weeks off from running and spent plenty of time in physical therapy. Once I was cleared to run again, my PT advised me not to run the marathon this year. He wasn’t the only one. Coaches and friends also suggested I take it easy. However, I got a second opinion from my orthopaedic doctor (also a distance runner), who wrote me out a very specific run/walk interval plan to help get me to race day. He said that it was a very ambitious, and maybe crazy, goal — but it just might work. Instead of aspiring to finish the Chicago Marathon, my new goal was just to get to the starting line. If I could do that, I would have accomplished something that people said couldn’t be done. Fast-forward through a sweltering summer of gradually increasing intervals and mileage in 100% humidity, returning to Galloway for Saturday morning long runs with the 12-minute pace group, and continued PT and constant foam-rolling. It soon became apparent that I might actually make it to the marathon start line! (I joked that everything after the start would be my “victory lap.”) About a month before the race, my tight calf muscles started causing problems for my knee on long runs, but I did everything I could to take good care of it. I was all smiles (and nerves!) at the Race Expo. My husband and I flew into O’Hare the Thursday before the race and spent a couple days at my parents’ house. Friday morning, we headed into the city for the race expo — which was unbelievable! The huge McCormick Place convention center was jam-packed with people, vendors, and race gear. It was overwhelming, and we easily could’ve spent half the day there. However, despite the magnitude of the event, it was the most efficient packet pickup I’ve ever experienced. In less than 5 minutes, someone scanned my pickup ticket, checked my ID, and sent me to a specific table where my bib number was already waiting for me. Next, we braved the Nike official race gear section. Although it was only Friday at 11am, it was as busy as the mall on Black Friday. The official merchandise selection was excellent, although overpriced. Once we cleared the Nike gauntlet, we wandered through booths for all the other major running companies — most of which had their own lines of Chicago-specific gear. Other vendors included races, charities, accessories, and even wine tastings. We spent Friday evening and Saturday relaxing before heading to a downtown hotel Saturday night. We had plenty of time at the start line. I didn’t cross until 50 minutes after the elite runners! Sunday: race day! We lucked out and had amazing weather — 45 at the start and 65 at the finish, with sunny skies all the way. There isn’t much shade on the second half of the course, though, so it warmed up quick (and I got a nice sunburn to boot). It was a 10-minute walk from my hotel to the starting area. Even with heightened security, I cleared the entrance gate in less than 2 minutes (I had to open the pouch on my water belt but that was it) and made my way to my start corral. Security, communication, and corral organization were efficient and easy to navigate. The first wave of runners started at 7:30am, and my wave started at 8… But my corral didn’t cross the start line until 8:20. I had plenty of time to make friends with my fellow Corral K runners. I may be biased, but the course is absolutely fantastic. It’s flat (with a few minor hills), scenic, and one big party! It’s a giant loop that winds through 29 neighborhoods on the the three different sides of the city. Crowd support is constant and high-energy (although it is true that the first half has more spectators). There were cheerleaders in Boystown, a mariachi block party in Pilsen, Gangnam Style blasting down on the South Side, an Elvis impersonator in Old Town, a marching band at UIC, and countless church and charity groups rocking to music and waving homemade motivational signs along the way. I can honestly say I had FUN the entire race! It’s a spectator-friendly course, as well; my family “fan club” was able to see me at 6 different points along the race route. Also, the volunteers are amazing, there were tons of photographers, and there were so many well-stocked aid stations that I probably could’ve gone without my trusty water belt. I’m glad I had it in the end, though, because I needed my full stash of gels and snacks, and it was helpful to have extra water when the temperature warmed up. My plan was to stick to 2:1 run/walk intervals until about mile 20, when I’d reevaluate based on how I felt. I started out nice and slow, determined not to get caught up in the high energy of the first half and go out too fast. I ran into a fellow Raleigh Galloway runner around mile 1, and we stuck together for several miles. We saw two other runners from our group as well! Around mile 10, I picked up the pace (hitting a 2:54 half split) and felt fantastic until 18-20, when the sun rose higher and the shade disappeared. I kept waiting to hit “the wall” (which I’d never done, since I’d been unable to run more than 20 miles in training because of my modified, doctor-approved schedule), but fortunately I never did! My knee held up really well, and I never had any major pains — just some very sore feet by the end. My outstanding “race crew” met me at 6 different points along the course. When I saw my family for the last time around mile 24, I told them that “I don’t feel ‘good,’ but I’ve felt much worse.” From there, I turned off my interval timer and switched to as-needed walking. I’d pick a building in the distance and decide that I would run until I reached that building, and then take a quick walk break. 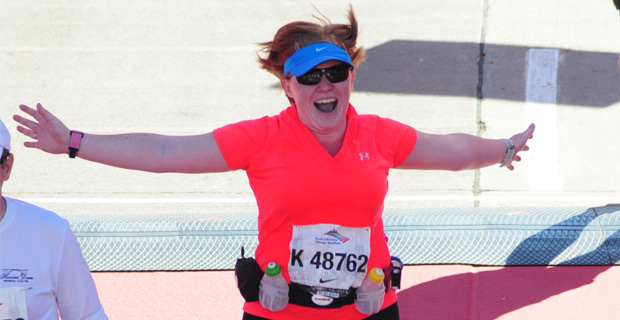 I remember thinking about things I might do differently for my next marathon… Which was exciting, because it means I never thought “I hate this! I’m never doing this again!” This was proof that I had trained well and was truly prepared. The months of sacrifice and hard work were worth it! Crossing the finish line was amazing, but also strangely anti-climactic. Due to increased security measures, the general public was not allowed anywhere near the finish. You could feel the energy of the elated runners (myself included!) sprinting toward the finish, but it was such a stark contrast to the handful of spectators in the largely empty grandstand. The whole experience was a bit surreal. After crossing the line, we walked down a never-ending chute of blankets, water bottles, medals, photos, etc. — all while being watched over by medical staff. It was literally another mile before we arrived at the publicly accessible runner reunite area. It was packed, but I found my crew easily, and we headed home. I finished the CHICAGO Marathon. I ran injury-free with a big smile on my face the whole time! I finished in 5:50:03 — under 6 hours. I ran fairly even splits, with a 2:54 half time. I beat my fundraising goal as a member of Alex’s Lemonade Stand’s Team Lemon and brought in $377 for childhood cancer research. I will definitely be running this one again! Now, when’s my next race??? Check out all the photos from my marathon experience here!